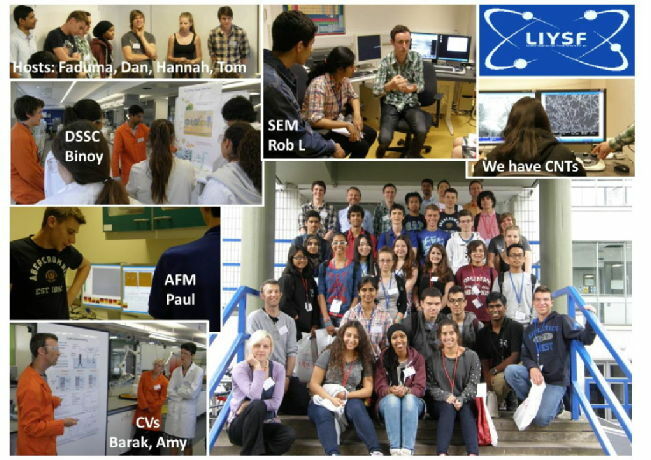 Once again, the Warwick Electrochemistry and Interfaces Group hosted 23 young enthusiastic international students participating in the annual 'London International Youth Science Forum' (LIYSF). The students enjoyed a day full of hands-on activities, giving them a glimpse of the cutting-edge research at the electrochemistry and interfaces group. This year, LIYSF’s underlying theme is ‘Challenging Science Boundaries’, focussing on the growing demand for an interdisciplinary approach to research and its impact on future students. Small groups of students investigated structural and electrochemical properties of in-house grown carbon nanotube network (CNT). The students got hands-on experience with electrochemical techniques, atomic force microscopy (AFM) and scanning electron microscopy (SEM). They also got to build dye sensitized solar cell (DSSC) devices, measure their performance and realize how closely related they are to photosynthesis! Most important was the interaction between the young visitors and group members who both hugely inspired each other, talking over lunch. We have hosted the LIYSF for each of the past 10 years and look forward to further visits in the future! Special thanks go to Barak Aaronson and Binoy Paulose Nadappuram who organized the day, Paul Kirkman who prepared state-of-the-art CNTs samples and demonstrated the AFM, Rob Lazenby on the SEM and Amy Perry in the electrochemistry station. Thanks also to Dan Warr, Tom Scott, Hannah Colledge and Faduma Maddar who accompanied groups throughout the day and to all group members who got involved (Yangrae Kim and Bruno Campos Janegitz for taking pictures). Special thanks go to Christina Forbes and Nick Barker who helped with logistics.